Notorious FDA? Feds Turn To Hip-Hop To Tamp Down Teen Smoking : Shots - Health News For its latest anti-tobacco campaign, the Food and Drug Administration wants to harness hip-hop swagger to reach minority teens — who disproportionately suffer the consequences of smoking. An ad from the Food and Drug Administration's Fresh Empire campaign. The federal government is getting into hip-hop — well, sort of. For its latest anti-tobacco campaign, the Food and Drug Administration is trying to harness hip-hop sounds, style and swagger to reach black, Hispanic and other minority teens — who disproportionately suffer the consequences of smoking. The campaign — called Fresh Empire — features videos with dancers, DJs, beat-boxers and rappers. In one of the ads, California-based artist Jessica Williams, whose stage name is Jayy Starr, does a spoken-word piece about her grandfather's battle with lung cancer. Williams and all the other hip-hop stars featured in the public health campaign are spreading a simple message, says the FDA's Kathy Crosby, who worked on the campaign. 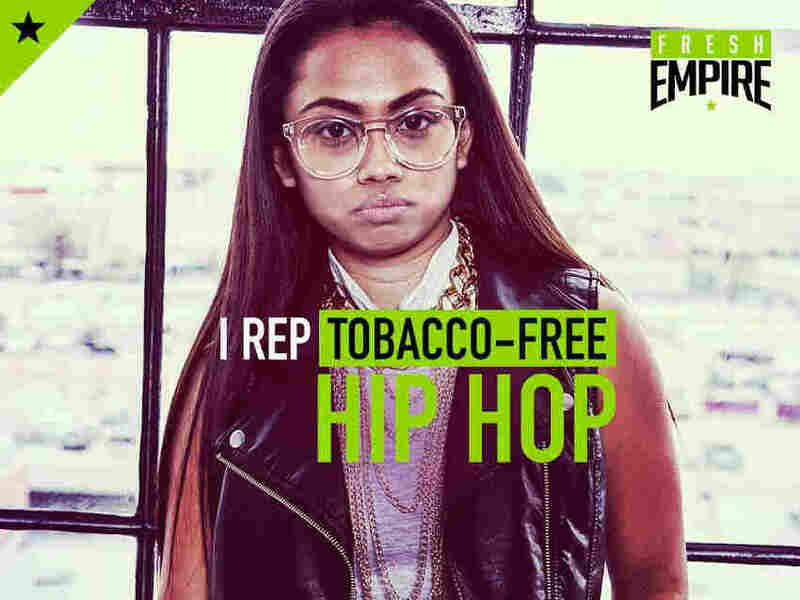 "They're helping us seed the notion that you can be hip-hop and tobacco-free," she says. "We went into different communities and found these up-and-coming dancers, up-and-coming rappers, up-and-coming DJs that are really role models within their community." But can the federal government really pull off hip-hop? "My own impression was that it was corny and forced — and trying too hard to appeal to urban youth," says Brian Mooney, a teacher at High Tech High School in North Bergen, N.J., who often incorporates hip-hop into lesson plans. So the response from students in his sophomore English class came as a surprise. Sophomore Olivia Ruiz's reaction, after watching the videos: "They're cool. I mean, they got swag." "Especially the music in the background and the fashion and everything," says Amirah Johnson, another student. "It's like we're seeing ourselves on TV." Another teen in the class, Ana Guzman, says it's nice to see people who look, walk and talk like herself and her friends. "It's more of the things that we do, more of the things that we listen to, more of the things that we daily live by," Guzman says. She and her friends like to fool around and freestyle rap after school, just like the teens in the Fresh Empire videos. Could it be? Has the FDA somehow transformed into The Notorious FDA? All told, the campaign will cost $128 million, paid for by tobacco industry fees. The FDA is betting that investment will pay off, partly because the approach is based on a growing body of research showing that teens — more so than any other age group — care deeply about their social group. And to really get to teens you first have to understand how they see themselves. Are they hip-hop? Goth? Preppy? Or, maybe, something else entirely. Meghan Moran, an assistant professor who specializes in health communication at Johns Hopkins School of Public Health, led a recent study looking at health campaigns that tap into teen culture. She recruited 250 teens, ages 13 to 15, and asked them to describe the subculture or group that fit them best. Then she had everyone look at ads that either targeted their crowd or a different group. "We found that when youth were exposed to messages that targeted their particular subculture or crowd, they were much more likely to respond favorably to that message," Moran says. That outcome may strike some as obvious, she says, but until recently, public health campaigns have taken a more generalized, one-size-fits-all approach. "And now we know," she says, "that's not necessarily the most effective way to go about things." Moran wasn't involved in the development of the FDA's campaign, but thinks it could lend much needed help in driving down rates of smoking among minority youth. Tobacco-related illnesses are the No. 1 cause of death among African-Americans — though a slightly higher percentage of white Americans smoke. Plus, cigarette companies spend millions marketing to hip-hop fans — sponsoring concerts and buying up product placement spots in music videos, notes Dr. Pam Ling, an internist and professor at the University of California, San Francisco. Ling didn't work on the FDA's campaign, but has studied and designed other anti-tobacco campaigns aimed at young people. "The campaign does a good job of competing with a lot of the commercial marketing we see that targets young people of color," she says. Not all the FDA ads hit the mark. Most of Brian Mooney's New Jersey sophomores were skeptical of one that starts with a guy picking up his girlfriend in his car. "He didn't even say 'hello' when she walked into the car," Melina Soriano points out. "He needs to say 'hello!' "
But everyone loved the spoken-word piece. Fifteen-year-old Jahvel Pierce remembers first seeing it on the music channel MTV, during a commercial break. "It really drew me in," he says. The piece does go deeper than most commercials, or even PSAs, adds his classmate Ana Guzman. She had an uncle who died of lung cancer and says the campaign especially resonates with her. "When he passed away I made a promise," she says. "I made a promise to myself and to him, not to smoke, because I don't want to give more to a company that just killed my uncle. So, that video, basically, was describing my life."